HSV-1, HSV-2 and VZV are responsible for a wide spectrum of clinical conditions from rashes to encephalitis in both immunocompetent and immunocompromised people. That’s why you want optimized detection and monitoring of HSV-1, HSV-2 and VZV infection. HSV1 HSV2 VZV virus R-GENE® is an ideal solution, offering rapid and specific detection. You can detect infection prior to clinical symptoms to improve options for management and test patients during treatment to measure its effectiveness. You can also test after treatment to monitor for relapse. For even more comprehensive testing, you can use the R-GENE® range to quantify various viruses from one sample or simultaneously analyze various samples for a single type of virus. 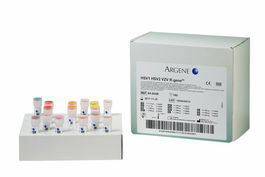 The HSV1 HSV2 VZV R-GENE® kit is a ready-to-use molecular detection kit that measures the viral load of HSV-1, HSV-2 and VZV using real-time PCR after viral DNA extraction. This 5’ nuclease-based real-time PCR assay amplifies a specific region of each virus genome. Supplementary reagents also available: amplification premixes HSV1 R-GENE® (71-015 – 60 tests), HSV2 R-GENE® (71-016 - 60 tests), VZV R-GENE® (71-017 - 60 tests). It is simple to use the HSV1 HSV2 VZV R-GENE® kit. 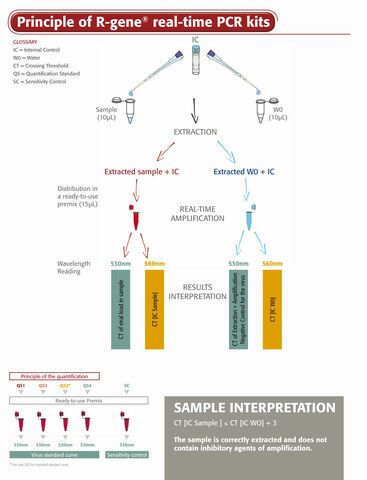 All you do is add the extracted DNA sample to the ready-to-use PCR master mixes and start the reaction on the appropriate Real-Time PCR thermocycler, following optimized cycling program described in the “Instructions For Use”. What are HSV-1, HSV-2 and VZV? There are eight human Herpesviridae, of which Herpes Simplex Virus Types 1 (HSV-1) and 2 (HSV-2) and Varicella Zoster Virus (VZV) are the most common in immunocompetent patients. The primary infection of HSV-1 and HSV-2 and VZV is generally limited to the mucous membranes and the skin. Usually benign, the infections linked with these viruses can nevertheless develop into severe clinical forms such as encephalitis, meningitis, retinitis and neonatal infections. After primary infection, the viruses persist in the host in a latent state. However, when assisted by chronic or transient immunosuppression, they can be reactivated, causing recurrent infections. In these severe and often atypical infections, the implicated virus cannot be identified. For many years various antivirals have proven their worth in efficiently treating these pathologies if prescribed early and at appropriate doses. Both immunocompetent and immunodepressed people can be affected by these viruses. Among the severe forms of HSV-1, HSV-2 or VZV infections in adults, HSV-1-induced encephalitis – of which there are 1/250,000 to 1/1,000,000 cases per year – can still be fatal if untreated. Encephalitis caused by HSV-2 or VZV usually has a more favorable prognosis. However, neonatal encephalitis can be traced to both HSV-1 and HSV-2 viruses, but the HSV-2 virus is responsible for the most serious neurological disorders. VZV virus has long been associated with encephalitis in immunodepressed patients. More recently, viral genome detection techniques have also increasingly shown VZV in meningo-encephalitis type infections in immunocompetent subjects. What are the benefits of HSV-1, HSV-2 and VZV testing? Conventional immunological culture and detection techniques are suitable for diagnosing the benign skin infections for which these viruses are responsible. However, they are unsuitable for severe infections of the central nervous system (CNS) and congenital infections. In severe infections, it is essential to obtain an early and rapid diagnosis of the infection. Quantitative HSV-1, HSV-2 and VZV DNA PCR tests are the ideal tool for CNS specimens and to follow congenital infections. Real-Time quantitative PCR-based assays for HSV1, HSV2 and VZV can be used to detect the presence of the virus and keep track of the course of the infections by monitoring the effectiveness of active treatment and for relapse after treatment. Le Bonheur Children's Medical Center, Memphis.